Although land-use planning changes the spatial and physical aspects of a rural countryside, it also has impact on and is influenced by social and economic conditions. The status of these conditions can hardly be changed by land-use planning on a farm-level scale. Only through nationwide or statewide land-use planning can certain changes be achieved. This is especially so for multiple land-use planning. In this section, some issues between land-use planning for farming and socioeconomic conditions are presented. • promotion of and provision of the means for nature management by farmers. Figure 2.13. The land-use planning spectrum. Source: . Land-use planning has to struggle with two dimensions of sustainability : ecological conservation and economic existence. Conservation is a striving to restore and preserve; Development is a striving to create and "improve." 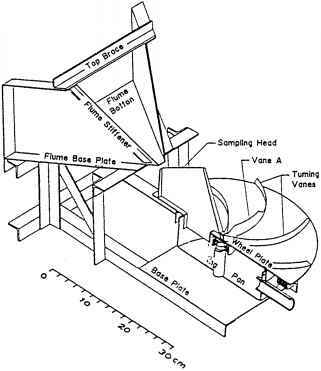 Figure 2.13 illustrates this. Land-use planning, however, can go further than the above mentioned protection of the natural resources; it can help to restore lost values. This is the case when, for example, farmland is turned into nature areas . The second issue is multifunctional land-use planning, which occurs on a larger scale than one or a few farms. More types of land uses have to be taken into account when planning on this scale; it cannot be restricted to farming alone. The most suitable use of land has to be determined with regard to the land qualities and the requirements that each type of land use has. This may not be agriculture, even in an agricultural area. 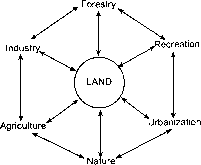 Sometimes mixed forms of land use are possible and, in fact, have even been encouraged  where they take into account the interrelationships among the land uses (see Fig. 2.14). The third issue concerns the market principle and economic conditions. The agricultural interest in certain kinds of land is determined by the situation in the agricultural market . The market has more influence in some political systems than in others, depending on the extent of freedom of pricing. If land prices are low, many farmers will want to buy land, so that the pressure on the market for land increases. Land-use planning has to deal with this problem, for example, by making more land suitable for farming. Figure 2.14. Multiple land-use planning. When the demand for farmland is low, land-use planning can transform agricultural land into nature reserves or recreational sites. Agriculture always has been an important sector in almost every economic system in the world. Most nations have been and are dependent on agricultural exports . Governments have treated agriculture according to its importance to the national economy and, in many cases, have made the improvement of agricultural conditions the single goal of land-use planning. In developing countries, land-use planning and rural development may be used to increase exports consisting of primary agricultural products, such as cocoa butter, raw timber, and soybeans. These products are processed, after being imported, in developed countries . In this situation, land-use planning can be used in two ways: The first is to help increase the production level of the primary production systems. The second is to help to develop ways to process the primary products in their country of origin, thus stimulating the national economy. Land-use planning is only one of the many instruments needed to enhance these complex, international relationships. The fourth issue is rural development. When the agricultural system in a certain area is improved by land-use planning, the rural area, which usually is connected closely with agriculture, benefits from this improvement. In most cases, land-use planning will improve not only the conditions for farming, but also for other land uses (see the preceding discussion of multifunctional land-use planning). Conditions in the area as a whole will improve, in most cases causing a higher level of economic activity. When this happens, land-use planning can provide some of the conditions for increased economic activity, for example, through improvement of the infrastructure. The improvement of a rural area with regard to its economic possibilities and its social and environmental "health," is called rural development. Land-use planning and rural development go hand in hand: one needs the other, and there is no clear boundary between them . However, there are, two sides to rural development. The most important is the above-mentioned development of the area. The other side is the increase in property taxes and the general cost of living . The increase in property taxes is a result of the increased value of the land arising from the demand for more land to facilitate the economic activities. This is even more the case when the increased economic activity leads to urbanization of the countryside. Speculation and the market principle lead to higher land prices. A higher service level for the inhabitants of the area leads to higher cost of the primary services. The fifth, and final, issue is knowledge. Generally, much knowledge and information are required about what, how, where, and why planning should take place. For farming, land-use planning involves information about the land and about farming. Information about the land provides insight into the opportunities and constraints of each type of land for agriculture. The land qualities mentioned in Section 2.2.3 can be a good guide when gathering information. The spatial requirements of agriculture can be found in Section 2.2.2. It is essential that all information be integrated in an information system. Such a system makes it possible to assess biophysical and spatial effects of the alternative land-use options and to make decisions as to the best alternative . Aside from the information about land and agriculture, some knowledge about the planning process is necessary. This is reviewed in Section 2.1.